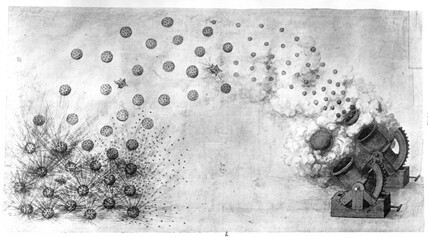 Mortars discharging explosive shells and shrapnel, late 15th century. Leonardo da Vinci (1452-1519) was an Italian painter, sculptor, architect, engineer and inventor of the Renaisance period. He had a wide knowledge and understanding far beyond his times of most of the sciences, including biology, anatomy, physiology, hydrodynamics, mechanics and aeronautics. His notebooks, written in mirror writing, contain original remarks on all of these areas. Leonardo da Vinci, Italian artist and engineer, c 1500. Leonardo da Vinci, Italian artist, engineer and inventor, c 1510. Da Vinci helicopter and tank, late 15th century. Designs for the wings of a flying machine, late 15th century. Technical drawing of a giant crosbow by Leonardo da Vinci, late 15th century. Treadmill-loaded crosbow by Leonardo da Vinci, 1470-1520. Design for the wing of a flying machine, by Leonardo da Vinci, 15th century.